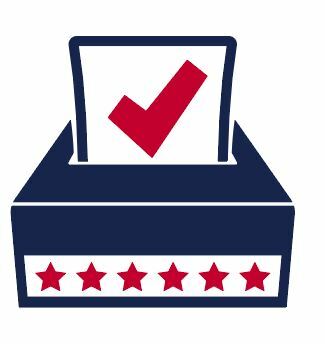 Active duty service members, along with their family members, rely on absentee voting to cast their vote for elections at all levels of government while overseas, deployed, or while stationed in states other than where they are registered. While there is some research surrounding the logistics of absentee voting, not enough is known about the experiences of active duty military and their families with absentee voting. Through a grant from the Democracy Fund, the Military Officers Association of America (MOAA) and the Institute for Veterans and Military Families (IVMF) partnered to gather information from military family members about their perceptions, challenges and barriers associated with voting and absentee voting as active duty military members. 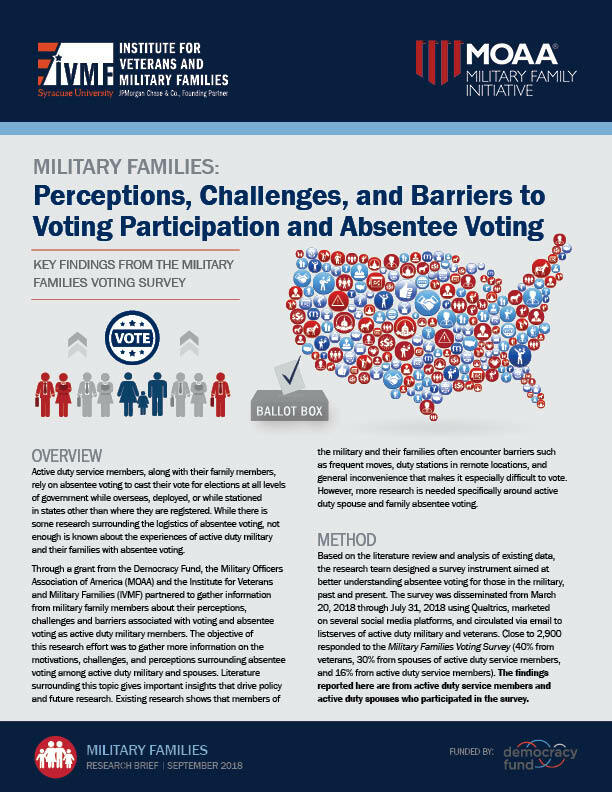 The objective of this research effort was to gather more information on the motivations, challenges, and perceptions surrounding absentee voting among active duty military and spouses. Literature surrounding this topic gives important insights that drive policy and future research. Existing research shows that members of the military and their families often encounter barriers such as frequent moves, duty stations in remote locations, and general inconvenience that makes it especially difficult to vote. However, more research is needed specifically around active duty spouse and family absentee voting. Based on the literature review and analysis of existing data, the research team designed a survey instrument aimed at better understanding absentee voting for those in the military, past and present. The survey was disseminated from March 20, 2018 through July 31, 2018 using Qualtrics, marketed on several social media platforms, and circulated via email to listserves of active duty military and veterans. Close to 2,900 responded to the Military Families Voting Survey (40% from veterans, 30% from spouses of active duty service members, and 16% from active duty service members). 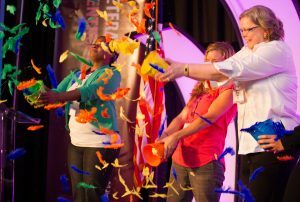 The findings reported here are from active duty service members and active duty spouses who participated in the survey. Approximately 71% of active duty and 69% of active duty spouse respondents believe voting is a civic duty. About 57% Active Duty Respondents vote in every election (federal, state, and local). 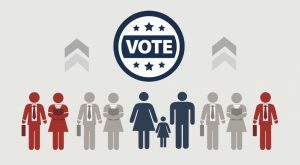 Only 36% of Active Duty Spouse Respondents vote in every election (most spouses vote in presidential, elections, but not necessarily in state or local elections). About 67% of active duty respondents were confident their ballot was counted and indicated it was easy to get voting assistance on or near their installation. A similar percentage of active duty spouse respondents were confident their ballot was counted, but only 40% felt it was easy to obtain voting information. Nearly 85% of all military family respondents did not use voter registration drives to obtain voting information. They were not interested in voting. They did not know how to get an absentee ballot. Of those who participated in the survey, 70% of active duty members felt they were encouraged to vote, while only 27% of their spouses felt encouraged to vote, and 54% of spouses felt they were neither encouraged nor discouraged. A large majority of both active duty respondents and their spouses felt military leaders neither influenced their likelihood of voting nor who to vote for. Views are mixed on the likelihood of foreign intervention in the 2016 U.S. Presidential election. Just over 48% of active duty and 42% of active duty spouse respondents expressed belief that there was foreign intervention, compared to approximately 21% of active duty and 24% of active duty spouse respondents who did not believe there was intervention. Just over 24% of active duty and 27% of active duty spouse respondents neither agree nor disagree there was foreign intervention in the 2016 presidential election. A majority indicated foreign interference would not affect their likelihood of voting. Of those who felt there was interference, 58% of active duty respondents said it did not change their confidence in the voting system. However, 63% of active duty spouse respondents had less confidence in the absentee voting process as a result of the intervention. A majority of military families expressed satisfaction with the overall absentee ballot process (74% of active duty and 66% of active duty spouse respondents). Over 72% of active duty and spouse respondents required an absentee ballot because they were not registered to vote in the same place they resided. 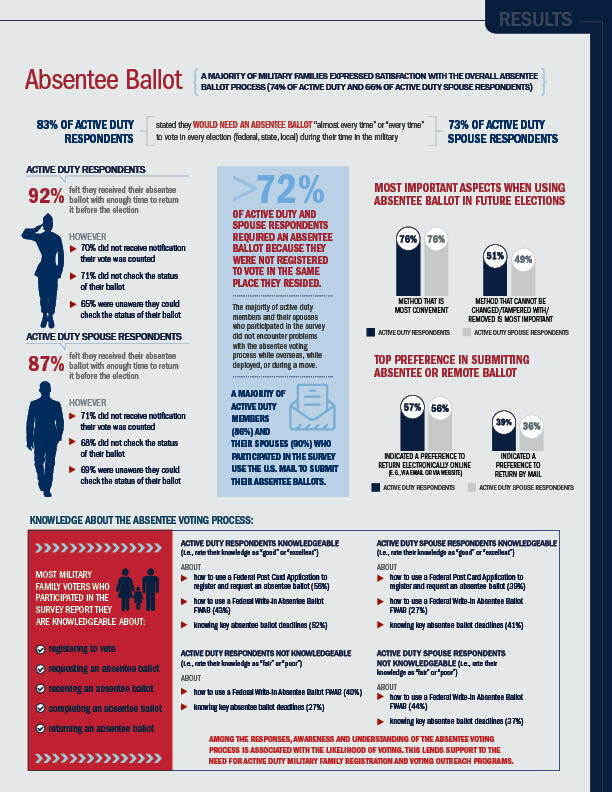 A majority of active duty members (86%) and their spouses (90%) who participated in the survey use the U.S. mail to submit their absentee ballots. Over 83% of active duty and 73% of active duty spouse respondents stated they would need an absentee ballot “almost every time” or “every time” to vote in every election (federal, state, local) during their time in the military. 65% were unaware they could check the status of their ballot. 69% did not know they could check the status of their ballot. 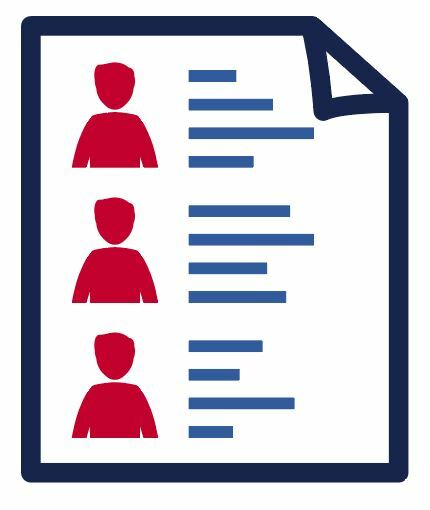 Most military family voters who participated in the survey report they are knowledgeable about registering to vote, requesting an absentee ballot, receiving an absentee ballot, completing an absentee ballot, and returning an absentee ballot. Only 56% of active duty and 39% of active duty spouse respondents consider themselves knowledgeable about how to use a Federal Post Card Application to register and request an absentee ballot (i.e., rate their knowledge as “good” or “excellent”). Only 43% of active duty and 27% of active duty spouse respondents consider themselves knowledgeable about how to use a Federal Write-In Absentee Ballot FWAB (i.e., rate their knowledge as “good” or “excellent”). 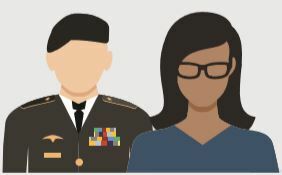 About 40% of active duty and 44% of active duty spouse respondents consider themselves not knowledgeable about how to use the FWAB (i.e., rate their knowledge as “fair” or “poor”). 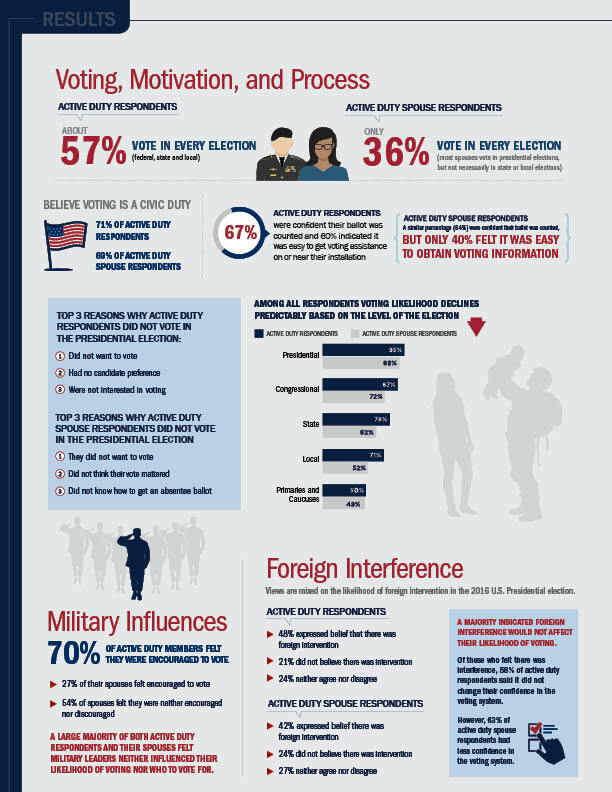 Only 52% of active duty and 41% of active duty spouse respondents consider themselves knowledgeable about knowing key absentee ballot deadlines (i.e., rate their knowledge as “good” or “excellent”). About 27% of active duty and 37% of active duty spouse respondents consider themselves not knowledgeable about knowing key absentee ballot deadlines (i.e., rate their knowledge as “fair” or “poor”). Among the responses, awareness and understanding of the absentee voting process is associated with the likelihood of voting. This lends support to the need for active duty military family registration and voting outreach program. The majority of active duty members and their spouses who participated in the survey did not encounter problems with the absentee voting process while overseas, while deployed, or during a move. When asked about most important aspects when using absentee ballot in future elections, 76% of active duty and 76% of active duty spouse respondents indicated that a method that is most convenient is the most important aspect. This is followed by 51% of active duty and 49% of active duty spouse respondents who indicated that method that cannot be changed/tampered with/removed is most important. When asked about the preference in submitting absentee or remote ballot, 57% of active duty and 56% of active duty spouse respondents indicated a preference to return electronically online (e.g., via email or via website) followed by 39% of active duty and 36% of active duty spouse respondents who indicated a preference to return by mail. The study findings can be used to inform efforts at all levels of government involved with improving military absentee voting. 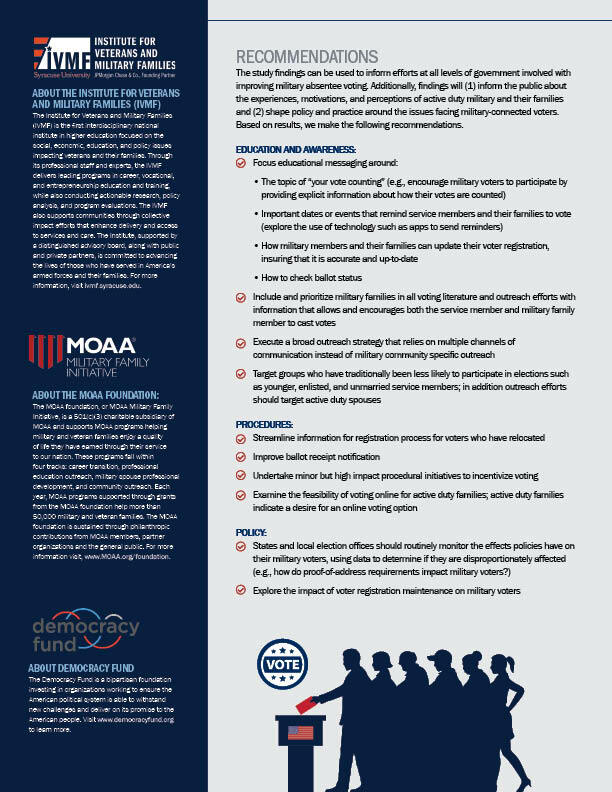 Additionally, findings will (1) inform the public about the experiences, motivations, and perceptions of active duty military and their families and (2) shape policy and practice around the issues facing military-connected voters. Based on results, we make the following recommendations. 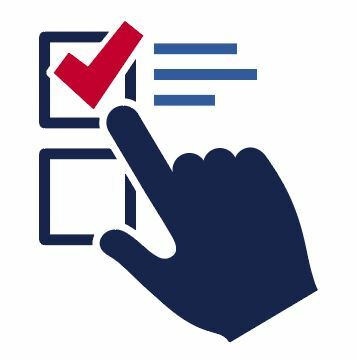 The topic of “your vote counting” (e.g., encourage military voters to participate by providing explicit information about how their votes are counted). How military members and their families can update their voter registration, insuring that it is accurate and up-to-date.